The React Trio Pro bow sight combines the benefits of a moveable and fixed-pin sight. It has two horizontal pins and a single, vertical pin that can be adjusted for any distance above 40 yards. React technology is the highlight feature of the bow sight that’s said to be mathematically precise in automatically adjusting your pins simultaneously. It means you’ll be spot on with any yardage from 20 yards up as the bow sight will accurately predict pin gap each time you adjust and shoot. It makes for sighting in a breeze, and it can be done rather quickly. You also have both 2nd and 3rd adjustable axis to make level shots and shooting at angles a strength. Another strength of yours will be fine-tuning your sight. It’s a tool-less bow sight with micro windage and elevation adjustments. Lock in your adjustments with the locking levers to keep them in place. The bow sight also comes with two rheostat lights: one for the yardage indicators and another for the pins. The construction is made with machined aluminum for ultimate durability. Some buyers weren’t impressed with the copolymer material of the React Series sights, but Trophy Ridge have ensured the React Trios have always had dependable metal build quality. If you’re undecided between choosing a fixed or a single-pin bow sight, the React Trio Pro is the best of both worlds. You can stretch the tape with your moveable pin or keep things simple with your fixed pins. Either way, with React technology, you get to yardage faster and with mathematical-guaranteed precision. Can the First Pin be set at a different yardage than 20 yards? No. The way the React technology works requires the first pin to be set at 20 yards. Subsequent pins must be set in 10 yard increments. On the React Trio Pro, this means the first two pins are set at 20 and 30 yards, the bottom pin set at 40 yards and then is adjustable out to 100 yards. What is the difference between the React Trio and the React Trio Pro? The noticeable differences are in the design and cosmetic features. On the React Trio, the side tape was rear-facing, and the shooter’s ring was different. The new React Trio Pro has fiber optic yardage indicators that are side-facing, a yellow, glow-in-the-dark shooter’s ring, and is said to be less bulky and sleeker than its predecessor. How much does the Trophy Ridge bow sight weigh? The React Trio Pro weighs only 9.5 ounces thanks to its aluminum construction. Are there multiple bow mounting positions? The bow sight bracket allows for three mounting positions to the riser. Is this a left-hand compatible bow sight? Unfortunately, this is not a universal bow sight nor can it can be mounted to a left-hand compound bow. Do Choice of Arrows matter with React Technology? Your setup must shoot arrows faster than 240 fps in order to be compatible with the React Trio Pro. Additionally, it doesn’t matter how heavy or light your choice of arrows are, as long as they’re consistent and you’re using the same arrows that you sight-in with. How does the React Technology work on the React Trio Pro? On multi-pin sights, the React tech would simultaneously move all the pins within the housing to ensure proper pin gap for the appropriate yardages. On the React Trio Pro, the yardage indicators move in place when you tighten/loosen the top screw to align it with the indicator pin. The space between the yardage indicators cater for accurate pin gap. Once you’re sighted-in, choose the appropriate yardage tape for reference. How to sight in the Trophy Ridge Trio Pro? You can sight in your 20-yard pin just to get on paper, if you wish. However, Trophy Ridge instructs you sight in your 40-yard (vertical) pin first. Ensure the indicator pin is at the very top of the slider, and use the micro adjustments to sight it in. Then you pick another distance and sight that one in using the slider and top screw to adjust for the appropriate pin gap between distances. Once done, you should now be sighted in for distances up to 100 yards in 10 yard increments. Go back and check you are dead-on for 20 and 30 yards. This is an excellent hunting bow sight as it has both fixed pins for fast shots, but it also has a moveable pin for when you want to stretch the distance. The React technology provides confidence in every shot at every distance because it’s already automatically adjusted for pin gap, especially if you’re shooting from a stand or on steep angles. We even named it one of our top picks for deer hunting bow sights. We also think the Trio Pro would make one of the best sights for archery. Narrowing things down, the React Trio Pro from Trophy Ridge has seen some outstanding upgrades that won’t have you considering the old model ever again. The new bow sight is lighter, has more accurate slider tracking, and is less bulky to mount and wield. It’s accurate, durable, and highly visible. Unfortunately, it is one of Trophy Ridge’s more expensive bow sights in the market. If you just don’t have the cash to spare, then consider one of their more economical options. The React V5 has a multi-pin setup with React technology. It’s much cheaper than the Trio Pro, but it’s the lack of an aluminum construction that brings the price down – check out the React V5 for yourself. In the same budget, the IQ Pro Hunter bow sight brings up the heat with its 3-pin setup that includes a floater pin. It’s very similar to the React Trio Pro in terms of “standard” features with adjustable 2/3 axis, tool-less adjustments, aluminum construction, and they’re both very new. However, instead of React technology, the Pro Hunter has IQ’s Retina Lock technology which you can find out more about in our full review of the IQ. 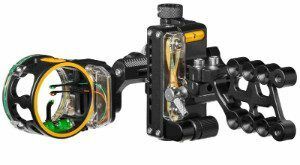 The React Trio Pro bow sight has a lot going for it and we have rated it as the best 3-pin bow sight in 2019. This newest model is the better model with its upgrades and smoother mechanics. If you’re looking to get accurate shots out to 100 yards with faster adjustments and zero mechanical errors, this is the bow sight you’ve been looking for!